Justin Bieber and Hailey Baldwin's relationship is speeding along, but everything came to a sudden, grinding halt Monday when his fancy sports car broke down. 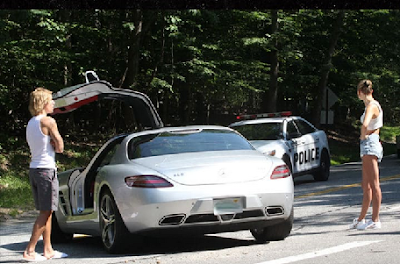 Biebs and Hailey were cruising in the Hamptons in a Mercedes-Benz SLS with gullwing doors, when they ran into car trouble. The supercar's got a starting price of about $200k and goes from 0-60 mph in less than 4 seconds. Justin and Hailey had to get help from a cop who directed traffic around the intersection where the Benz crapped out. A mechanic eventually showed up to repair the whip before the couple left the scene.